The Memorial, made by Toma Deliradev, was inaugurated on 2 June 1927 (St. Spas’ Day). For the ceremony on 4 July there came Tsar Boris III who unveiled the monument. He was welcomed by a big colored arch greeting him: “Welcome Our Blessed Tsar!”. The local press of the time reflected the event in the following way: “Yesterday Haskovo experienced an extraordinary celebration. The Unknown Soldier monument was inaugurated in the presence of 20 000 people from all over the Haskovo region” /Haskovo Post Newspaper 1927/. The was a memorial service for the local soldiers who had died in the battles. The Tsar delivered a speech and on behalf of the Prime Minister and the Government the speech was delivered by Minister Kulev. In 2007 we will celebrate 80 years of these events. 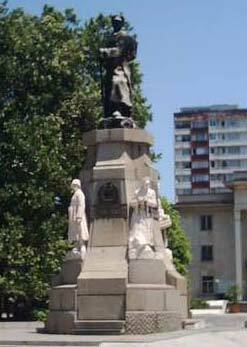 The Unknown Soldier monument has been a traditional place of respects on all occasions related to the Bulgarian history for generations on end since its inauguration.